Alto, California, start-up, Shockley Semiconductor Laboratory. 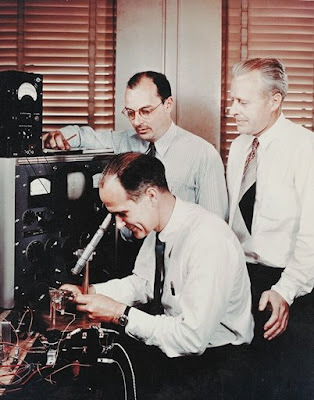 Shockley had been part of the Bell Labs team that invented the transistor. He had quit his job and come west to start his own company, telling people his goal was to make a million dollars. Everyone thought he was crazy. Shockley knew he wasn't. Unlike a lot of the people at Bell Labs, he knew the transistor was going to be big. Shockley had an idea about how to make transistors cheaply. He was going to fabricate them out of silicon. He had come to this valley, south of San Francisco, to start production.He felt like he was on the cusp of history, in the right place at the right time. All that he needed was the right people. Shockley was leaving nothing to chance. Today's interview was with Jim Gibbons. He was a young guy, early twenties. He already had a Stanford Ph.D. He had studied at Cambridge too - on a Fulbright scholarship he'd won. Gibbons was sitting in front of him right now, in Shockley's Quonset hut office. Shockley picked up his stopwatch. seven players, Shockley began, in measured tones. You've got one hundred twenty-six people paired off in sixty-three matches, plus one unpaired player as a bye. In the next round, there are sixty-four players and thirty-two matches. How many matches, total, does it take to determine a winner? Shockley wanted to know. Have you heard this before? Gibbons explained simply that it takes one match to eliminate one player. One hundred twenty-six players have to be eliminated to leave one winner. Therefore, there have to be 126 matches. Shockley almost threw a tantrum. That was how he would have solved the problem, he told Gibbons. Gibbons had the distinct impression that Shockley did not care for other people using "his" method. Shockley posed the next puzzle and clicked the stop-watch again. This one was harder for Gibbons. He thought a long time without answering. He noticed that, with each passing second, the room's atmosphere grew less tense. Shockley,seething at the previous answer, now relaxed like a man sinking into a hot bath. Finally, Shockley clicked off the stopwatch and said that Gibbons had already taken twice the lab average time to answer the question. He reported this with charitable satisfaction. Gibbons was hired. Excerpt from: How would you move Mount Fuji? : Microsoft's cult of the puzzle : how the world's smartest companies select the most creative thinkers by William Poundstone.